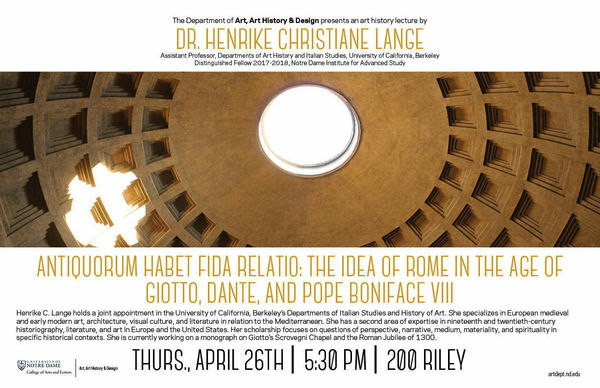 Henrike C. Lange Lectures on "Antiquorum Habet Fida Relatio: The Idea of Rome in the Age of Giotto, Dante, and Pope Boniface VIII"
The Department of Art, Art History & Design presents a lecture by Dr. Henrike Christiane Lange, Assistant Professor, Departments of Art History and Italian Studies, University of California, Berkeley and 2017-2018 Distinguished Fellow, Notre Dame Institute for Advanced Study. The title of her lecture is, “Antiquorum Habet Fida Relatio: The Idea of Rome in the Age of Giotto, Dante, and Pope Boniface VIII,” and will take place on Thursday, April 26th at 5:30 pm in 200 Riley Hall of Art. Henrike C. Lange holds a joint appointment in the University of California, Berkeley’s Departments of Italian Studies and History of Art. She specializes in European medieval and early modern art, architecture, visual culture, and literature in relation to the Mediterranean. She has a second area of expertise in nineteenth and twentieth-century historiography, literature, and art in Europe and the United States. Her scholarship focuses on questions of perspective, narrative, medium, materiality, and spirituality in specific historical contexts. She is currently working on a monograph on Giotto’s Scrovegni Chapel and the Roman Jubilee of 1300.